I’m up to Wonderquest‘s eighth level, which I think must be just about where I stopped the first time around. One thing in particular I remember: some dialogue where someone asks Chen the Scientist whether he believes in God. This isn’t something you often see discussed in games that aren’t specifically about God, although it’s plausible that it would come up in the circumstances. You’ve got a bunch of strangers from different walks of life and different cultures thrown together and relying on each other for survival over a longish period; it makes sense that they’d want to sound each other out on matters they consider important. But it would be an uncomfortable moment, and I remember it made me a little uncomfortable even to see it in the game back then, especially when the designated scientist replies that of course be believes, the signs of a guiding mind are all around us. What I didn’t remember, however, is that it’s all just a lead-in to a joke, a wink to the audience about how the world is made of tiles and has all these puzzles built into it. We get a major new non-DROD-based element on level 8, beam emitters that emit beams that act as obstacles, kill stuff that’s in the way, and even slowly burn their way through forest tiles. Force arrows can deflect the beams, as can Lucas the Priest’s shiny crucifix, making him a great deal more useful, at least for the duration of this level. I had been thinking of Lucas as the one real downgrade character, characterized mainly by his movement limitations, never preferred, only used when the game forces the issue. But when you think about it, the real downgrade is the one you start with, Jax. There are very few situations where Nikolay the Archer isn’t simply preferable to him. It’s worth noting that switching characters persists from room to room. If you leave a room in control of the Archer, you’ll still be the Archer when you enter the next room. The Second Sky tried to make it look like it had a similar system for its weapons, but I’m pretty sure that it was faking — that each room simply had its own default weapon, and the game contrived to make sure you were already wielding it before you entered. 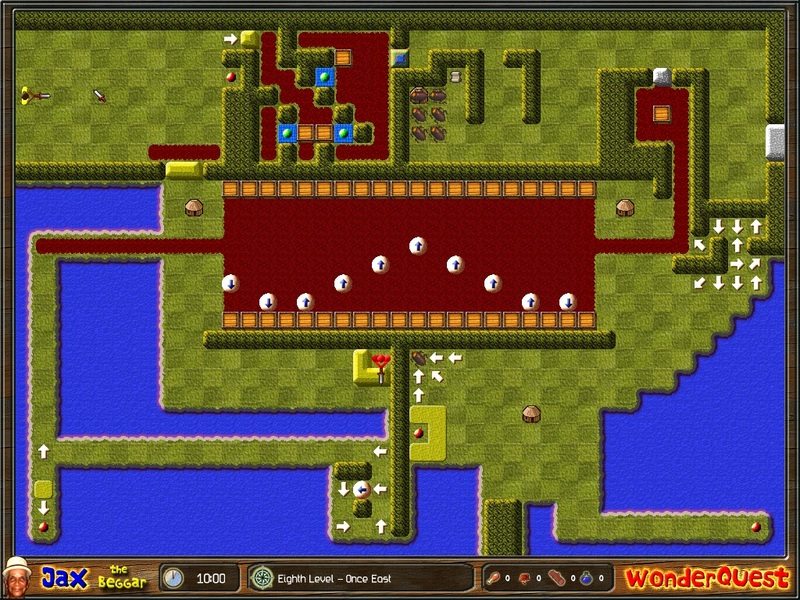 Whereas in Wonderquest, there are rooms you can enter as multiple different people. Usually this just means the room is partly water, and you can sail in from an adjacent room as Berk the Sailor, and have no place to land, and have to go somewhere else to come ashore and reach the room the proper way. Anything other than that risks breaking the puzzles by coming in with the wrong powers, and so rooms where you can change who you are tend to put unbypassable change-back-to-Jax tiles at all their exits. But there are secrets to be found by exploiting the exceptions. At any rate, by level 8, the puzzles are getting quite complex, and character-switching and beam emitters are only part of it — although it should be remembered that complexity is pretty much orthogonal to difficulty, and some of the least complex puzzles in DROD are among the most difficult ones, including some that I’m still stuck on. One of the more convoluted multi-stage puzzles on level 8 is identified by a scroll on the ground as the first complete Wonderquest room ever made, which surprised me a little. I’d expect the first puzzle made to be one that uses fewer elements, so that you wouldn’t have to implement a whole bunch of new ideas to get it working. How many times have you bought a detective game hoping to feel like Sherlock Holmes and got disappointed? I’ll tell you. Too many. These games should be about feeling like the smartest person in the room. Seeing what everybody else missed and connecting the dots. Getting to that wonderful moment in which everything clicks and you figure out what’s going on. Now, a thing about game jams: The ideas you get are going to be influenced by whatever is on your mind, which tends to be the games you’ve been playing. For example, when there was a Myst jam a couple of years ago, I was spending a lot of time playing a tower defense game, and so it occurred to me that Myst‘s “Channelwood” section, with its network of walkways, bore a superficial resemblance to a tower defense, and I wound up making a tower-defense-ish thing in that setting. Nowadays, I have DROD on the mind, and it’s in that frame of mind that I read this announcement. And… it’s a surprisingly good fit. “That wonderful moment in which everything clicks and you figure out what’s going on”? The only difference between that and the the experience of discovering the lynchpin in a good DROD puzzle is the tense, whether you’re figuring out what already happened or what has to happen. Locked room mysteries in particular resemble DROD puzzles, or a certain style of DROD puzzle: the ones that look flatly impossible until you have the right clever idea. Finding that clever idea is often a matter of deduction — once you have eliminated the unworkable, whatever remains, however difficult, must be correct. I’m imagining (vaguely) a game that makes this shared sensibility more explicit. You’d have a room — probably a grid of discrete tiles, just like in DROD, to keep things simple. You’d start by being shown the room in its final state, as it was when the police arrived. DROD lets you right-click on elements to get more information about them, and Wonderquest does it on mere hover; dress this feature up with a magnifying-glass-shaped cursor and it becomes thematic. This would give the player some ability to learn about how things behave and start to form theories about what must have happened before proceeding to the second stage: reproducing events. A flashback, in which you control one suspect of your choice and try to make the room match the state in which you found it. All other suspects would behave according to simple deterministic rules, as would everything else in the environment. Maybe there would be obvious approaches that almost work, but not quite — the bloodstains are one tile away from they belong, or the broken glass is on the wrong side of the window. Any such discrepancies would be highlighted, and you’d get to try again. The key thing here would be to try to eliminate ambiguity. It seems to me that most mystery games, if they make any attempt to induce clever deductions on the player’s part, fail by relying on assumptions that the player may not share. The player gives up and reads the solution, and at a crucial point it says “The only way to the second story window was by a ladder in the garage…” and the player’s response is “What? I could climb that wall!” A droddified reconstruction stage would make it clear exactly what the mechanics of the gameworld are, and thus what is and is not possible. Character-switching is really the main thing distinguishing Wonderquest from DROD, as far as I can tell. There are two ways it can happen. First, you can step on a tile that simply transforms the character under your control to a different one. The fiction is that all the characters in your party are travelling together, so I suppose this is an abstraction of giving a different person the lead. And he’ll remain in the lead even if you walk into a different room — often rooms will prevent this by putting tiles to change you back at all of a room’s exits, but there are occasional secrets guarded by obstacles that can only be overcome by transforming in another room some distance away. But the more interesting way to switch, puzzle-wise, is the Party Splitter tiles. In any room containing Party Splitters, some will be marked with an icon and others will be empty. Step on one with an icon, and you gain control of the corresponding party member while leaving the one you were previously controlling behind. Once you’ve done that, you can step on an empty splitter of the same color to switch back, leaving your current character dormant at that spot. It’s kind of like switching back and forth between clones or squaddies in DROD, and has some of the same uses, like ping-ponging monsters around as they keep switching who to pursue. But unlike in DROD, you can’t just do it anywhere, and the characters are not interchangeable. They all have unique abilities and limitations. This makes the act of switching more interesting and meaningful. Here are the abilities and limitations of the characters I’ve acquired so far. Jax, the Beggar: The initial player character. Armed with a knife. Completely equivalent to Beethro in the DROD games. Nikolay, the Archer (or Trekker, depending on which part of the UI you pay attention to): Capable of killing at a distance of five tiles, provided they’re in a straight line in one of the eight directions you can face. Perhaps ironically for an archer, he can’t step on force arrows. He can, however, climb towers that Jax can’t, and from atop them fire arrows over obstacles. Berk, the Sailor: Capable of traveling on water, but can’t come on land unless it’s to step on a character-change or party-splitter tile, which seriously curbs his usefulness. Unique for not being displayed on the map as a human figure; instead, he’s shown as a little boat. No offensive capabilities. Honestly, he feels more like a mode of transportation than a character, but he uses the same character-changing mechanics as everyone else. Lucas, the Priest: At this point, we abandon all attempt at linking the character’s profession to their abilities. Lucas’ main advantage is that he’s invisible to Eyes (which act just like the ones in DROD). The game explains this as him blinding them by reflecting light from his crucifix, which is also his weapon, equivalent to Jax’s knife. At any rate, it’s a fairly minor power, only useful because the puzzles are designed around it, and doesn’t feel like it makes up for his limitations: he can’t walk on grass, which is the main terrain type in most rooms, and he can’t move diagonally (another possible irony, considering how certain other games make their clergy only capable of moving diagonally). Not being able to move diagonally lets the author use him for pure Sokoban puzzles, which may or may not be a good thing for the work. Chen, the Scientist: Another mishmash of disparate traits that don’t have much to do with his profession. He’s armed with a bamboo pole that sticks out in two opposite directions, letting him attack monsters on both sides at once. He can’t step on mud, which is usually where the Priest is found, as if science and religion are too incompatible to share turf. But most importantly, he can swim. He has to remain within 2 tiles of shore, but unlike Berk, he can land anyplace, provided it’s not mud. It’s a highly international group, hailing from New York, Russia, Denmark, Brazil, and China. They’re all male, though. It’s taken me a while to admit this, but I think that I’m going to have to do something I’ve never done before: shelve a main-line DROD title while it’s still incomplete. Oh, I’ll get back to it. But for now, I’m playing other things, including one thing that I had previously intended to start after beating The Second Sky: Wonderquest, the only known DROD imitation outside of that one room in Frog Fractions 2, the one that looks misleadingly like Nethack. FF2 does that a lot, hiding a game pastiche under the skin of a different game pastiche. Instead of a dungeon, Wonderquest is set in a jungle. It’s functionally equivalent to a dungeon, just replacing stone walls with impassable forest. The player characters are from various places on Earth, and have no idea how they wound up there. Instead of a Smitemaster, your initial character is identified as a “Beggar”. It’s not nearly as slick as DROD. The tiles are noisy and repetitive. The music and sound effects are low-fidelity. The controls are a little awkward, even after you rebind them to match the DROD keys — holding down a movement key to go faster here results in zooming out of control, and is almost always a bad idea. Movement is animated continuously rather than moving in discrete steps from tile to tile, which probably seemed like an improvement to the designer, but I find it just muddies my understanding of what’s going on. The dialogue, revealed entirely by stepping on scrolls, is pretty terrible. The whole thing is a little amateurish, but amateurish in a way that I find a little comforting, hearkening back to a less commercial age of indie game development. Retro, but in a way that doesn’t feel like it’s doing it on purpose. This extends to the puzzles as well, at least in the early stages. Lots of repetitive action, with enemies in quantities that don’t make the puzzles harder or more interesting. I suppose it’s really no worse that some of the stuff in King Dugan’s Dungeon, but even that comes as a shock after playing so much of The Second Sky. For example, here’s a puzzle with two chambers, where you have to do exactly the same thing to both chambers. TSS had a number of puzzles that looked like this at first glance, but some slight asymmetry — maybe even just the placement of the entrance — meant that the seemingly-identical parts had to be approached completely differently. Here, there’s no such subtlety. That said, there are ways that it’s going beyond DROD, even in the first few levels. As I noted before, Wonderquest had tiles that change your weapon before DROD did, something that’s also true of force arrows that can be disabled like doors. Also, there’s an element that Wonderquest introduces on, a rolling ball that moves every turn in the same direction, unless stopped by a wall or redirected by a force arrow, potentially pushing crates or crushing monsters as it rolls, or activating orbs and pressure plates. This gets used a lot, sometimes in large quantities. There are rooms dominated by the balls bouncing around, a flurry of mechanical activity that ignores the player. Balls in isolated tracks are the main thing powering things like time limits and cyclical door-opening. One level in TSS had something similar to balls, rodent monsters called “lemmings” (presumably inspired by the game Lemmings) that move forward, ignoring the player, destroying everything destroyable in their path, but they were never as ubiquitous as the balls are here, or used with such versatility. As I write this, I’ve reached a level with giant butterflies that move in knight’s-moves, an idea found nowhere in DROD — probably because there isn’t a lot you can do with it, puzzle-wise. 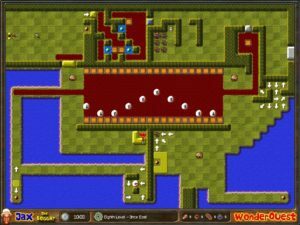 But Wonderquest has lower standards for its puzzles, and is content with providing multiple rooms where you’re simply mobbed by a swarm of the things. I know there’s a great deal more to come. I’ve played a few levels further than this, years ago, and remember some additional characters, with unique abilities. Also, the main UI has spots for a resource-gathering mechanic that I never played far enough to see. I hope to see it this time around.